It would be far worse for Trump to fire Rosenstein than to fire Mueller. Firing Rod Rosenstein would be far more effective, and far more dangerous, than firing Robert Mueller. 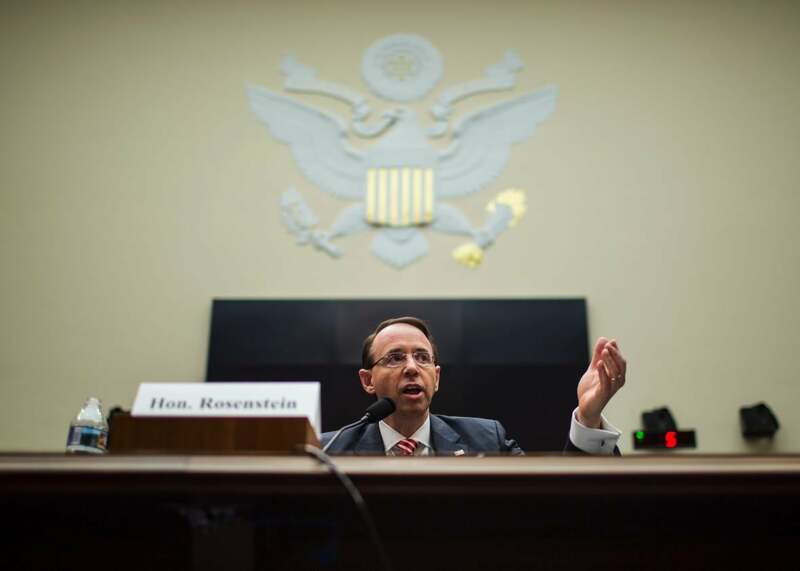 U.S. Deputy Attorney General Rod Rosenstein testifies during a House Judiciary Committee hearing on Wednesday in Washington. All eyes are on what Donald Trump will do, as the oracles on Twitter and the Hill have predicted that the president may fire special counsel Robert S. Mueller around the holidays. Trump’s lawyers have denied that he is considering such a move, and Trump himself has not directly criticized Mueller. However, Trump has recently expressed dissatisfaction with Deputy Attorney General Rod Rosenstein, calling him “weak” and a threat. Along with those comments, the Washington Post reports that “Trump appeared to be contemplating changes in the Justice Department’s leadership.” In short, there’s a good chance that the guillotine is poised for Rosenstein, not for Mueller—and if so, that is cause for even greater concern for all who care about the integrity of the Russia investigation and, yes, the rule of law. It’s important to remember that the Russia investigation existed before Mueller was appointed. In fact, the inquiry into Russia’s interference began as a counterintelligence investigation in June 2016, almost a year before Mueller came on the scene. Mueller was appointed as the special counsel in the wake of Trump’s firing of former FBI director James Comey to insulate the investigation from interference and (ironically) accusations of bias. Mueller simply stepped into an already-existing investigation and carried it forward with a team of prosecutors with greater independence but still oversight from the Justice Department. Just as Mueller’s appointment did not start the Russia investigation, his removal would not end it either. As I wrote following Comey’s firing, FBI investigations have a life of their own and cannot easily be killed: By law, the FBI is required to investigate any potential violation of federal law to its final resolution. Further, FBI investigations—particularly complex ones, like a deep probe into Russian interference—have a propensity to expand. That is, in the course of investigating one person, or crime, additional subjects or violations of law might be uncovered. In such situations, new cases would be opened. When we refer to the Russia investigation, then, we are really referring to multiple—perhaps even dozens—of cases involving many individuals. Some of these, like the charges against Paul Manafort and Rick Gates or the plea deals with George Papadopoulos and Michael Flynn, have already entered the judicial system. Other investigative leads, like subpoenas and document requests, are undoubtedly outstanding. In short, this train has left the station, and firing Mueller won’t stop it. The FBI would be compelled to pick it up and pursue these leads—perhaps with even greater rigor if its independence were under doubt after a Mueller firing. Nevertheless, the FBI can only pursue its investigative efforts with the assistance of a prosecutor. Obtaining evidence, either through the criminal process or grand jury testimony, and knowing which investigative avenues to pursue to build a case require the active participation of an attorney who can go into court and facilitate each step. Mueller, obviously, is fulfilling that function right now. But, although many people may not realize it, so is Rosenstein. Rosenstein is effectively Mueller’s boss. Although, under the special counsel regulations, Mueller does not have to report to Rosenstein day to day, he does need to check in with the DAG three months before the end of the fiscal year with a status report on the progress of the investigation, and Rosenstein has the power to “determine whether the investigation should continue.” Separately, Rosenstein has the power to require Mueller to “provide an explanation for any investigative or prosecutorial step” and can prevent Mueller from pursuing any action if, in his view, he believes that it is “inappropriate or unwarranted” under departmental practices. If he does so, he must report this decision to both the Senate and House Judiciary Committees. The fact that, six months into Mueller’s appointment, no such report has been made, and Mueller continues to take significant investigative and prosecutorial steps (including, most recently, obtaining tens of thousands of transition-team emails from the General Services Administration) suggests that Rosenstein is on board with the breadth, scope, and direction in which Mueller is taking the investigation. Removing Rosenstein and replacing him with a DAG who is at the very least more sympathetic to Trump could have drastic repercussions for the investigation. The new DAG could burden the special counsel with a requirement to provide an explanation for every move he makes and then decide that they aren’t necessary or appropriate. In fact, because Mueller is required to provide the DAG with at least three days’ notice in advance of any “significant event” in the investigation, she would have plenty of time to intervene and challenge Mueller’s actions (and a less scrupulous DAG could even leak Mueller’s plans to the White House or others). A new DAG would even have the ultimate, er, trump card: She could decide at some point that the investigation should not even continue at all. Of course, any attempt to override a decision by Mueller would need to be reported and justified to Congress. However, given the increased clamor of some GOP members and right-leaning media outlets against the Mueller investigation, a DAG’s rationale for pushing back on Mueller’s investigation would find a receptive audience in some circles, including on the Hill. The situation is delicate, and the DAG has a powerful platform to shift the balance of power against the investigation. Imagine the next DAG simply expressing doubts about Mueller in testifying before Congress, instead of projecting the level of confidence Rosenstein expressed last week before the House Judiciary Committee. Those are important moments in the life of this investigation, and a DAG not fully committed to the rule of law but to insulating the president and the White House from political and legal accountability could wreak havoc. And while it’s true that any permanent replacement for the DAG position would be required to go through a Senate confirmation hearing, Rosenstein would in the meantime be replaced by someone else. One path would involve turning to the attorney who’s next in line at the DOJ: Rachel Brand. Brand may, of course, continue Rosenstein’s efforts, but because she didn’t personally appoint Mueller and has implicit notice that her own job is on the line, holding as steady as Rosenstein has so far would require withstanding extraordinary pressure. None of us truly knows how a person will operate under such conditions. Another path available to the president would be finding a Senate-confirmed official somewhere in the administration (Trump would not be restricted to picking someone from the DOJ) under the Federal Vacancies Reform Act. An admittedly longer shot would be to pick anyone inside or outside of the government to serve as acting DAG as a recess appointment if the Senate is out of session for 10 days in a row. In short, the president has one move he can make in which the benefits to him might outweigh the costs. Since Rosenstein is his own political appointee, Trump has great discretion in deciding whether to remove him, and he can do it quickly and directly. And by removing Rosenstein but not touching Mueller, Trump can claim that he is in fact not trying to interfere with the Russia investigation at all: Indeed, it could be very hard to prove otherwise, which insulates him significantly from further obstruction charges. Firing Rosenstein but keeping Mueller gives the president the ultimate political and legal protection, and the crystal ball–gazers need to consider it.